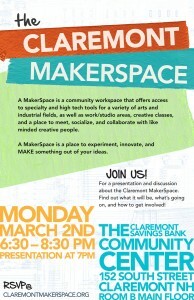 Join TwinState MakerSpaces for a presentation and discussion about the Claremont MakerSpace! The Claremont MakerSpace will be a community workshop and business incubator that provides members with high-tech and specialty tools for a range of artisanal and industrial fields, as well as training, creative classes, and work/studio space. This meeting will be on Monday, March 2nd, from 6:30 – 8:30 pm, at the Claremont Savings Bank Community Center – 152 South Street, Claremont, NH. A slide presentation will begin at 7, followed by a Q&A. This is the first Claremont MakerSpace meeting, and we’ll be covering everything from “What is a MakerSpace?” to specifics about bringing the Claremont MakerSpace to life and plans for upcoming meet-ups. 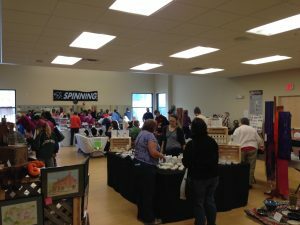 We’ll also be showing off some projects that local makers have created, to demonstrate the types of tools and classes that we plan to offer at the Claremont MakerSpace. Come and meet other Makers in the Upper Valley and find out how the Claremont MakerSpace is progressing. 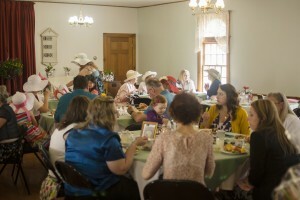 This event is open to the public and is for all ages.